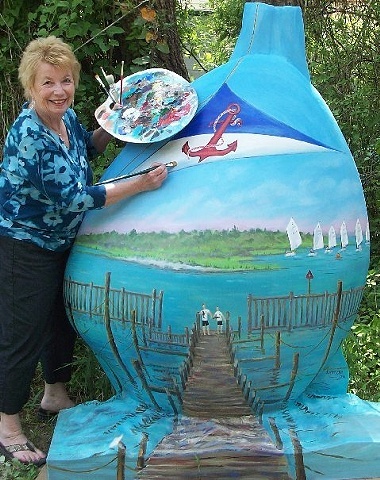 This painting on a Giant Clam is one of Cathleen's Efforts to help restock our beautiful Barnegat Bay with clams. This is a partnership with ReClam the Bay. Cathleen is particularly noted throughout the state for her historical paintings. Her sources include the historical societies, libraries, and a treasury of rare photographs. She has preserved historical New Jersey scenes. She has also done many paintings of Newark, Burlington, and Perth Amboy. Cathleen paints in oil, acryllic, watercolor, and offers giclee prints of her work.